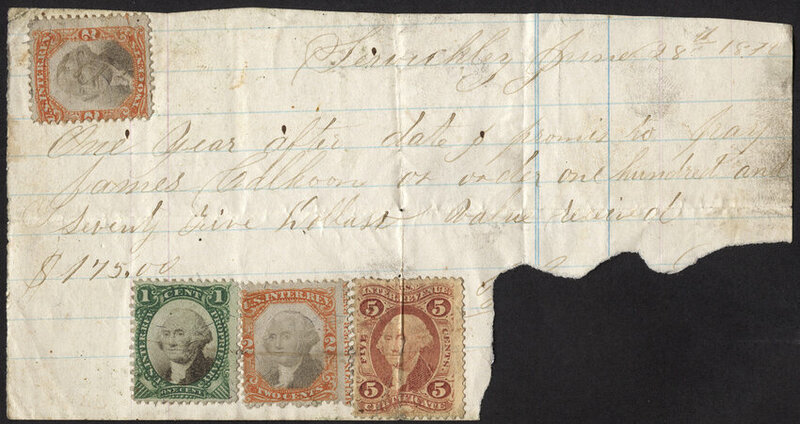 Another fun area to collect is trying to find early revenues that have either margin imprints or plate numbers still attached. 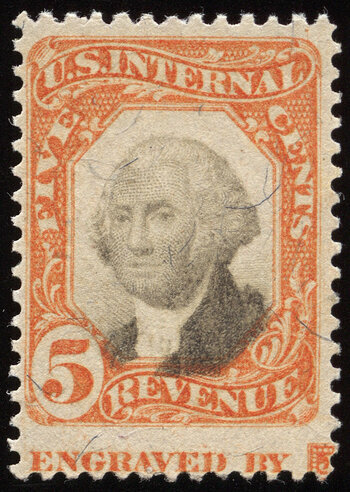 Margin imprint single of 5-cent Thomas Jefferson (Scott #76) postage stamp used illegally as a revenue stamp on an affidavit. 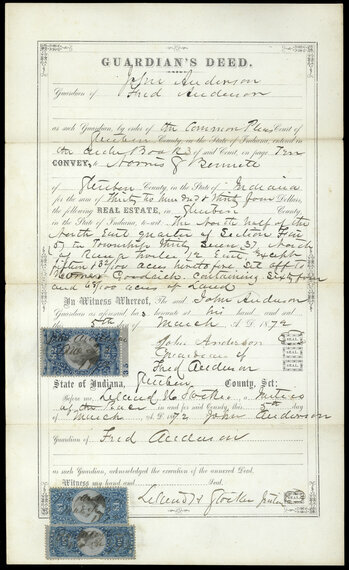 Ironically, the document is attesting to the fitness of a William Henderson to practice law. 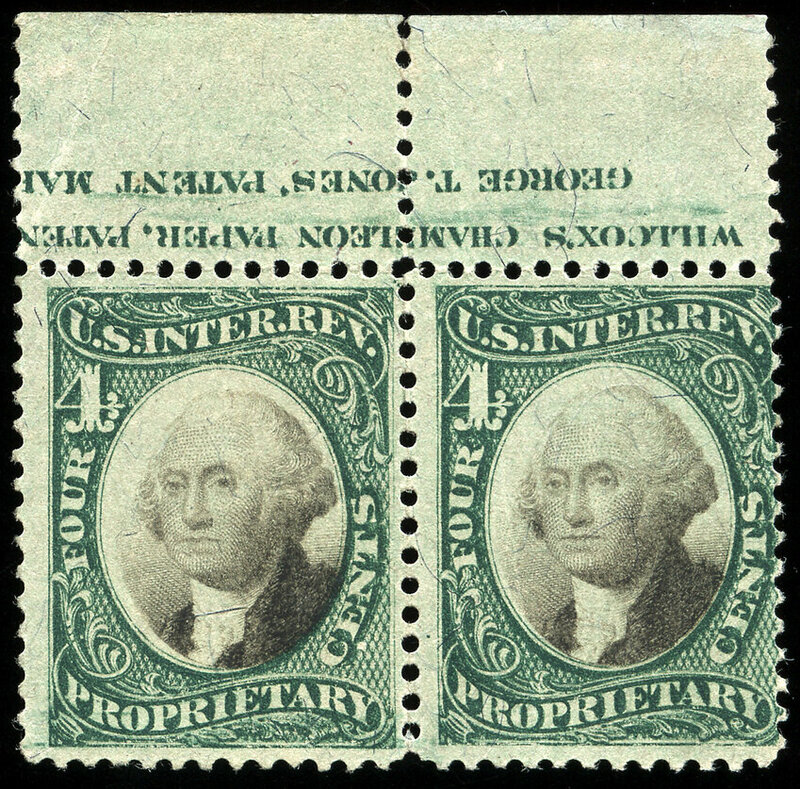 Horizontal pair with imprint capture. 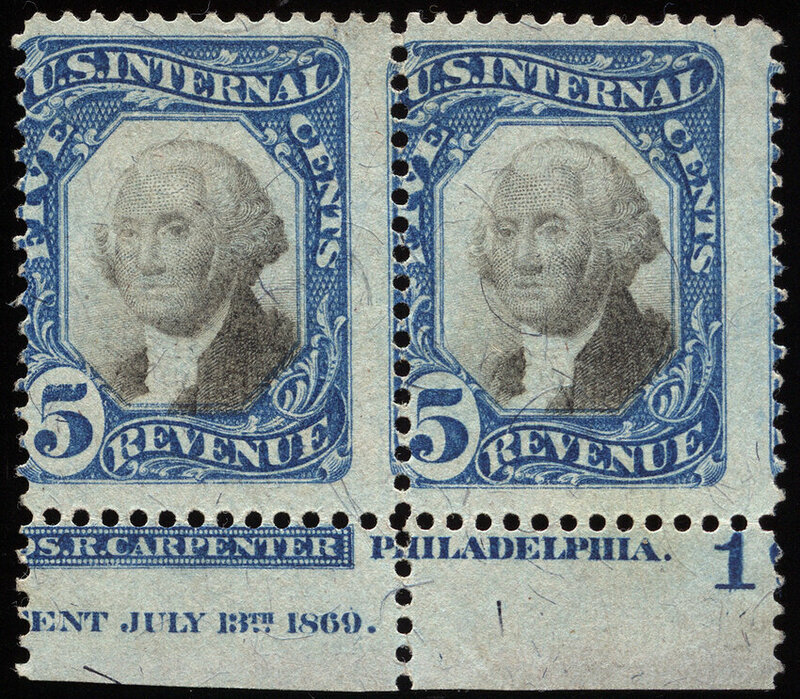 Plate blocks of 1st issue revenues are quite scarce. Granted, it has been very heavily reinforced around the edges. 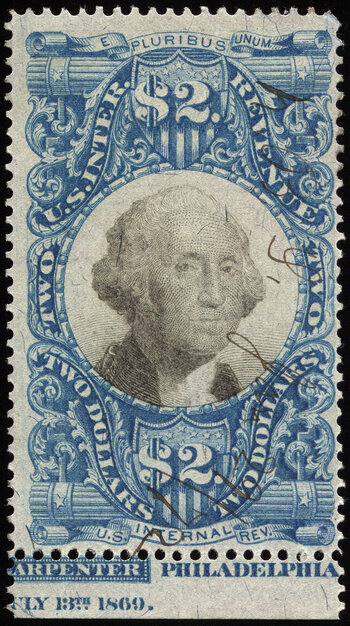 There are blue threads on 2 of the 24 stamps, but the PF has determined that it is not silk paper, so the block is not R6d. 2014 Philatelic Foundation Certificate. 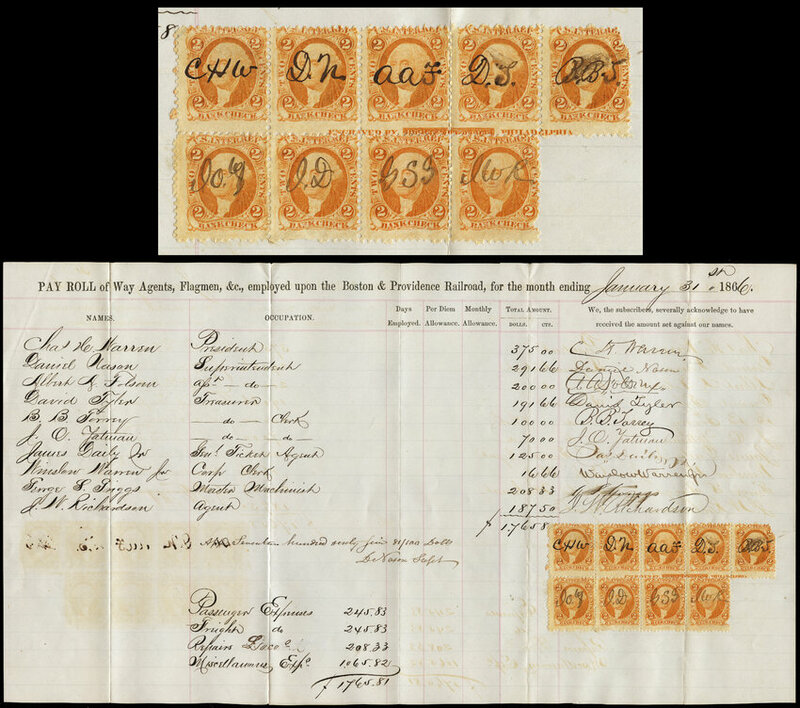 Complete bottom sheet margin imprint capture in a strip of 5, on a payroll ledger. Partial margin imprint at bottom. 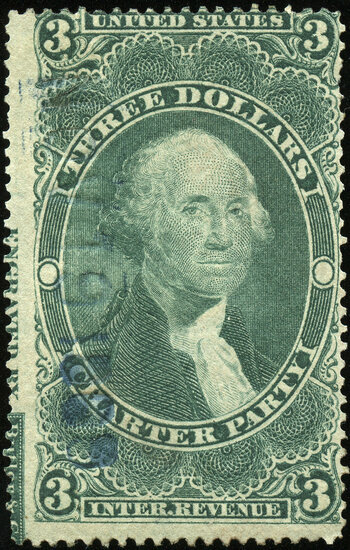 Bottom margin single with partial imprint. 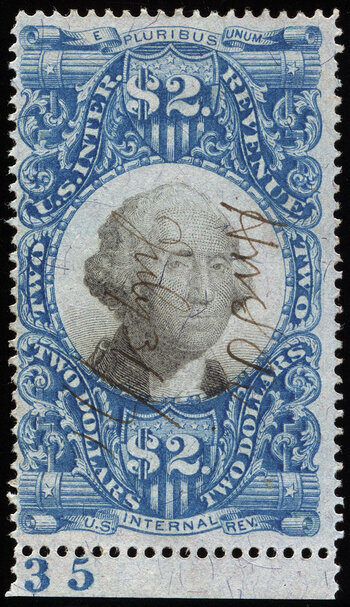 Jumbo margins with partial margin imprint at bottom. 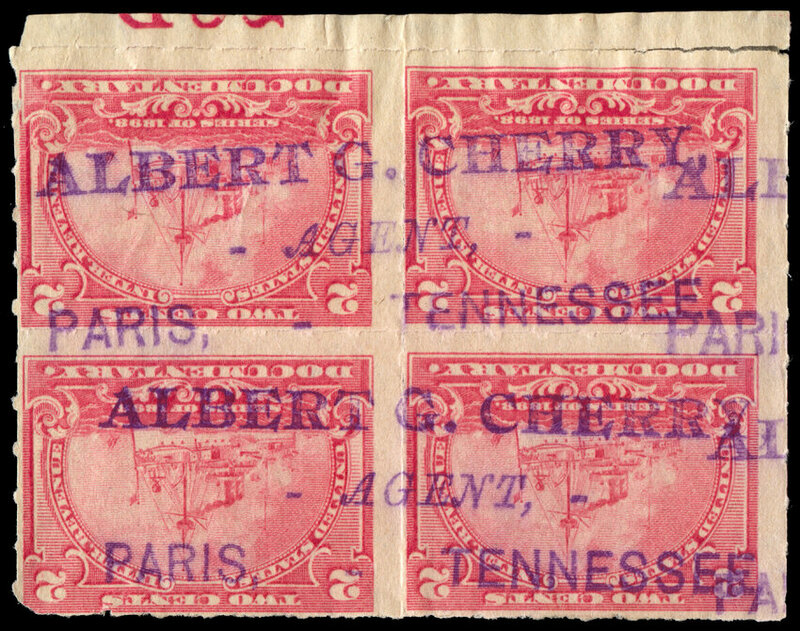 Plate block of 4 used on a tattered document. 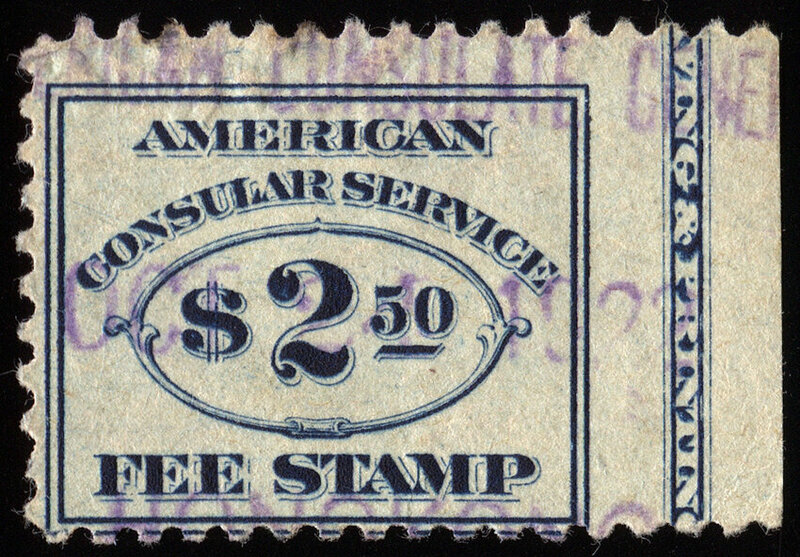 Mint with full original gum and margin imprint. Margin imprint capture at left. 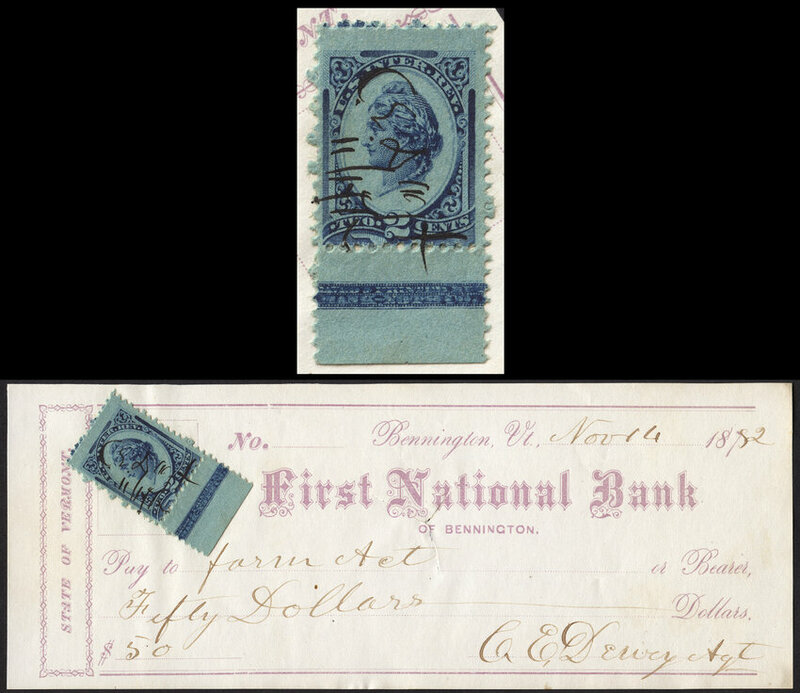 Jumbo margins at left and right with a margin imprint capture at left. 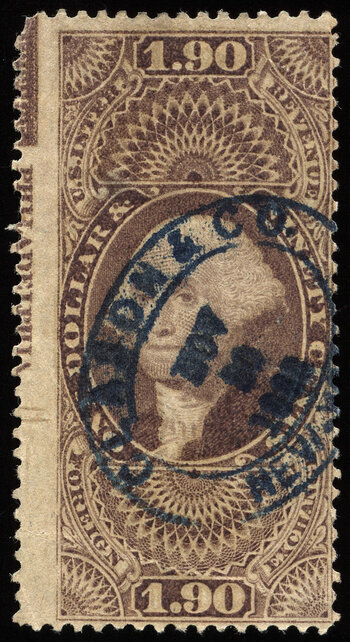 Amazing margin imprint running down the entire left side of stamp. Perfectly positioned! 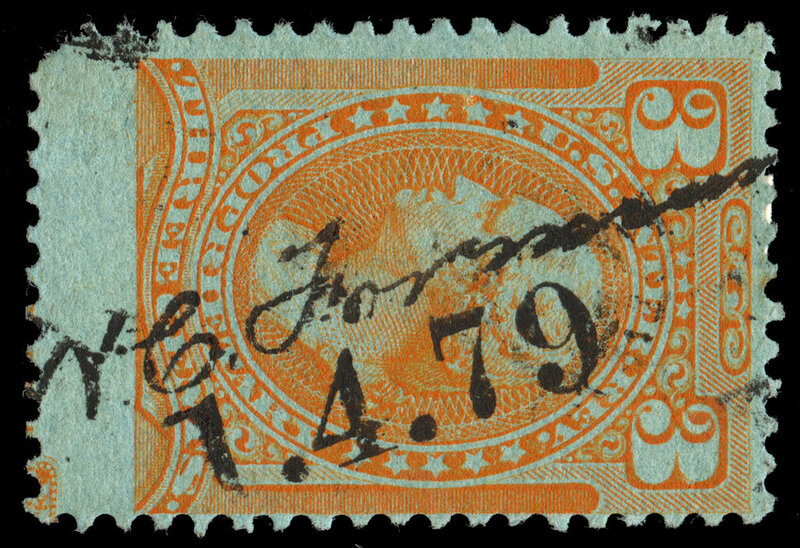 Plate number single with imprint. 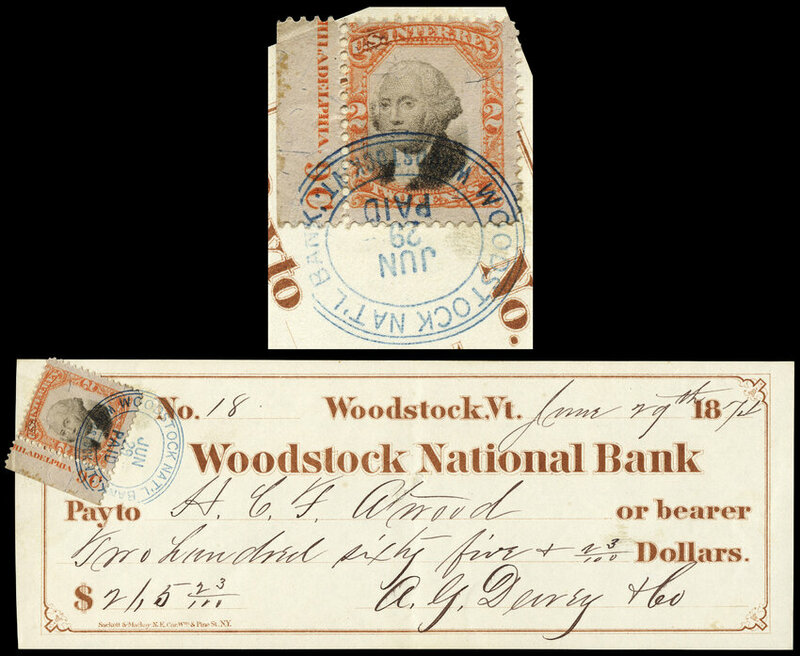 Vertical strip of 4 with partial margin imprint at bottom. 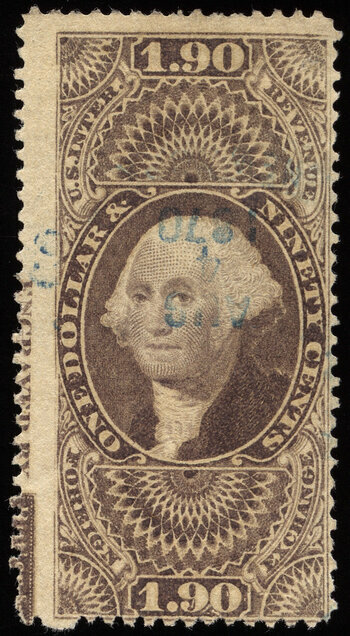 A bit of a wounded warrior, but a nice oval handstamp cancel and margin imprint at left. 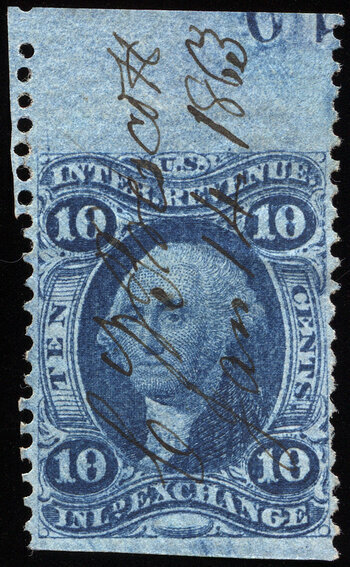 Undetermined blue handstamp cancel, partial margin imprint capture at left. 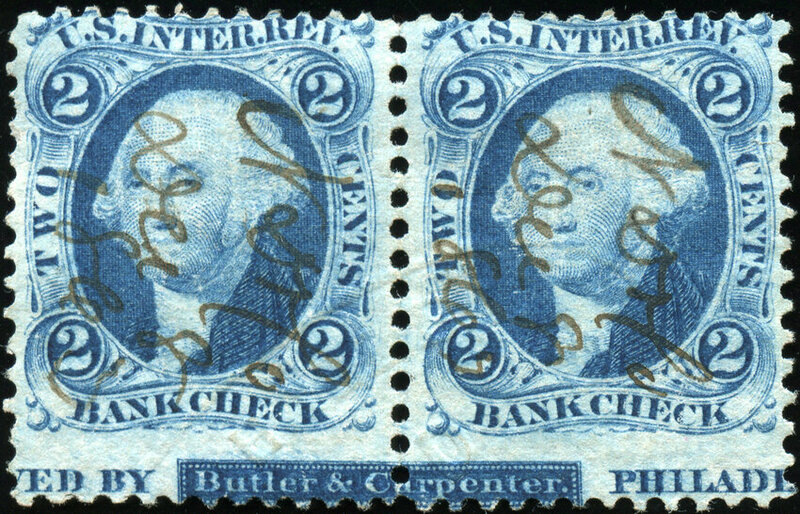 Margin imprint pair with partial plate number. Ex-Morrissey. Full margin imprint capture at bottom. 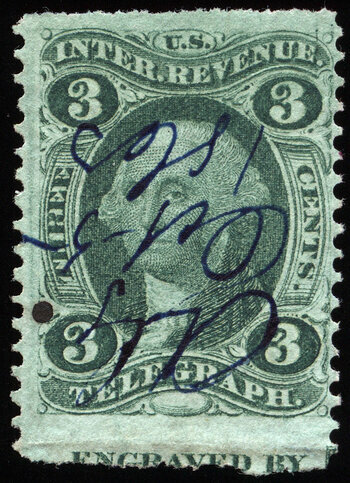 Bottom margin plate number single. Ex-Cleland. 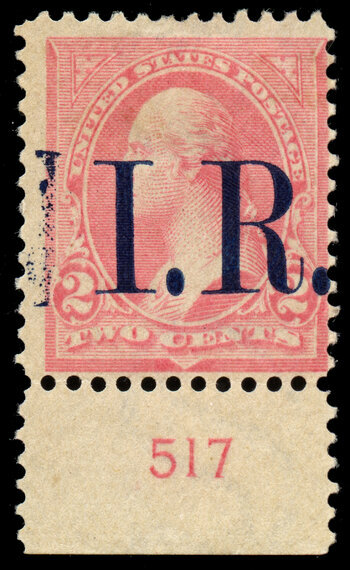 Plate number and imprint pair. Ex-Morrissey. $2 second issue plate number single on a guardian's deed, along with $1 and 50-cent stamps. 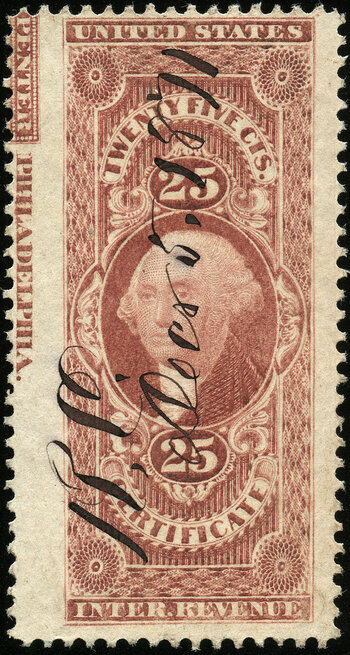 Full margin imprint at bottom. 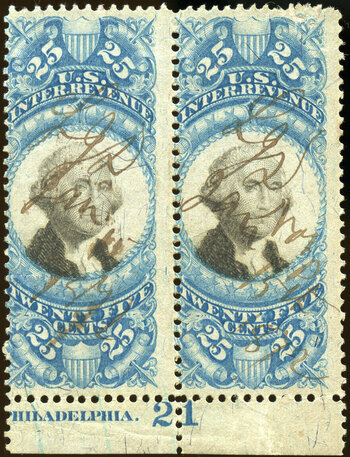 Left margin plate number strip of 4. Ex-Cleland. 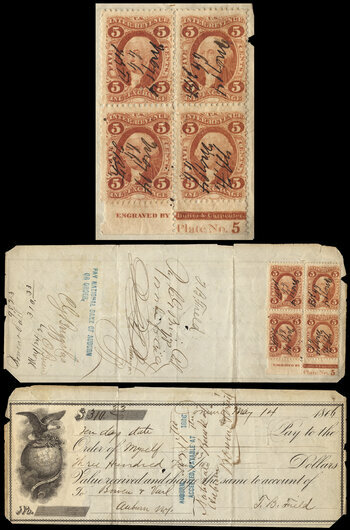 Left margin plate block of 6, plate 9. Ex-Cleland. 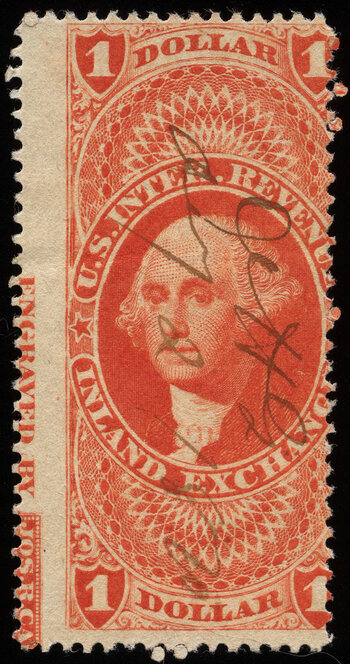 Plate number single with a nice well-struck oval cancel. Nice margin imprint capture at bottom. Partial imprint capture at top. 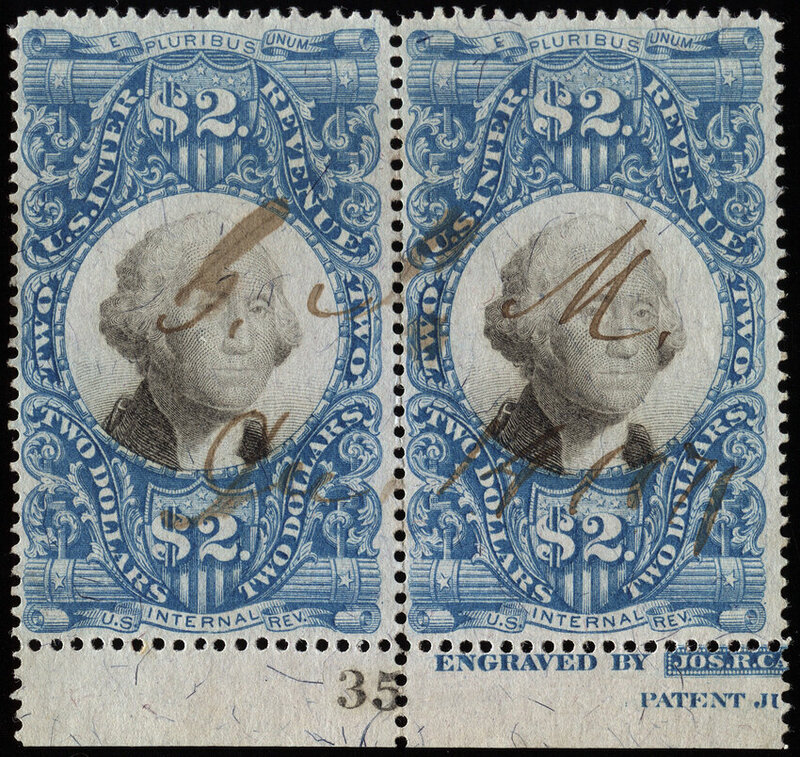 Bottom margin plate single, plate 25. Ex-Cleland. 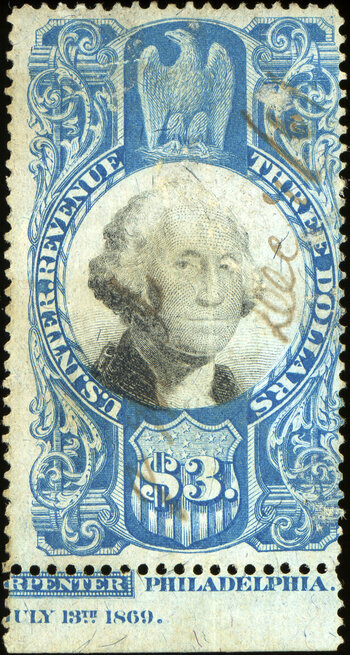 Left margin plate number single, plate C9. Ex-Cleland. 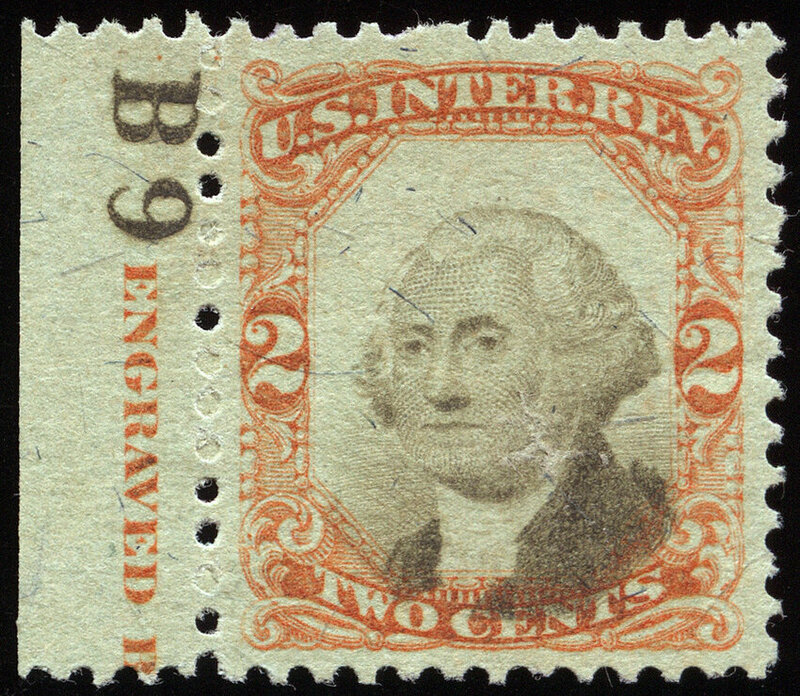 Left margin plate number single, plate B9. Ex-Cleland. 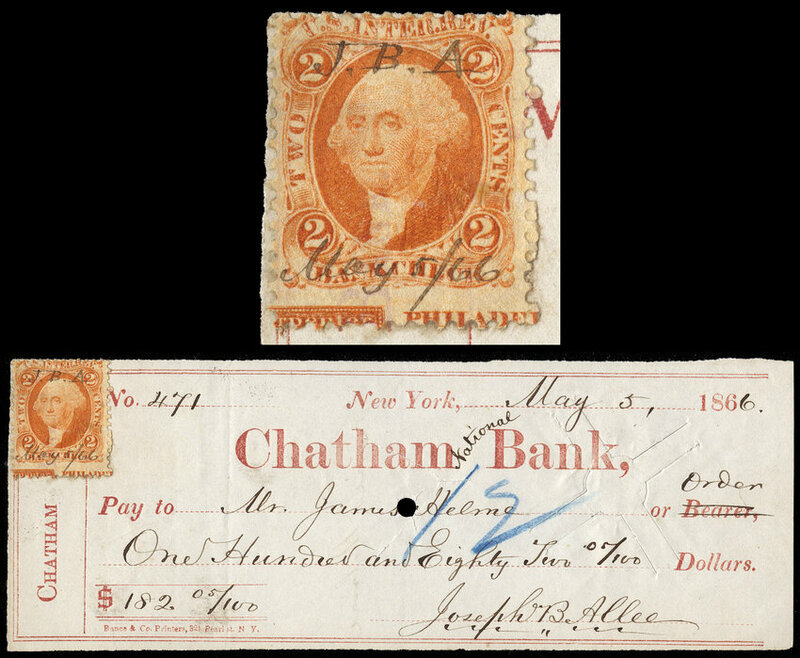 Nice margin imprint single used on bank check. Inking anomaly, possibly from a raised spacer or wooden furniture used in tightening the type. 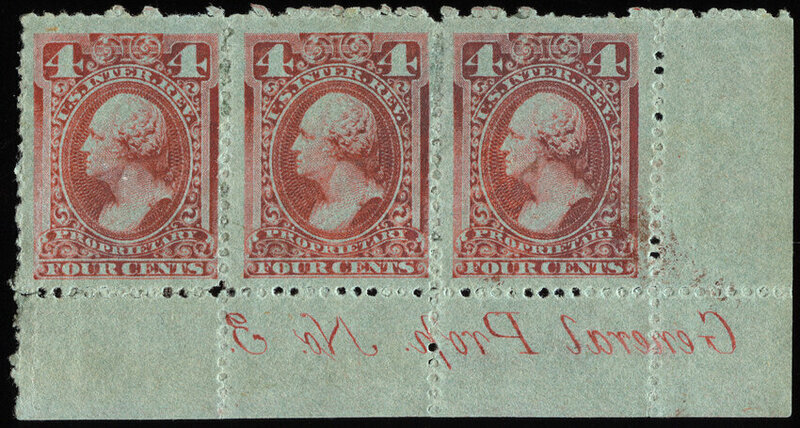 Block of 4 with partial margin imprint, showing a large format multiline handstamp cancel. Plate number strip of 4. Scott value above is as 4 singles. 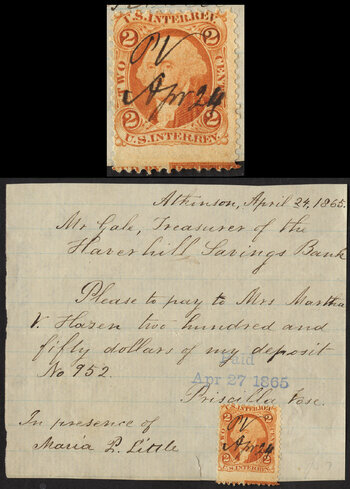 Durland lists a plate number strip of 3 at $350. 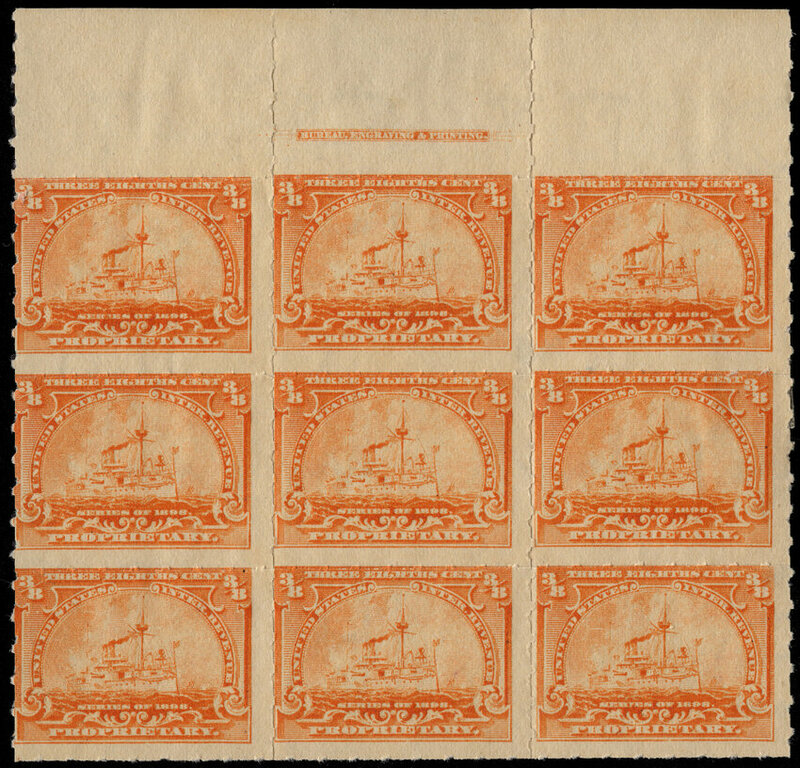 Plate block of 21, quite scarce. 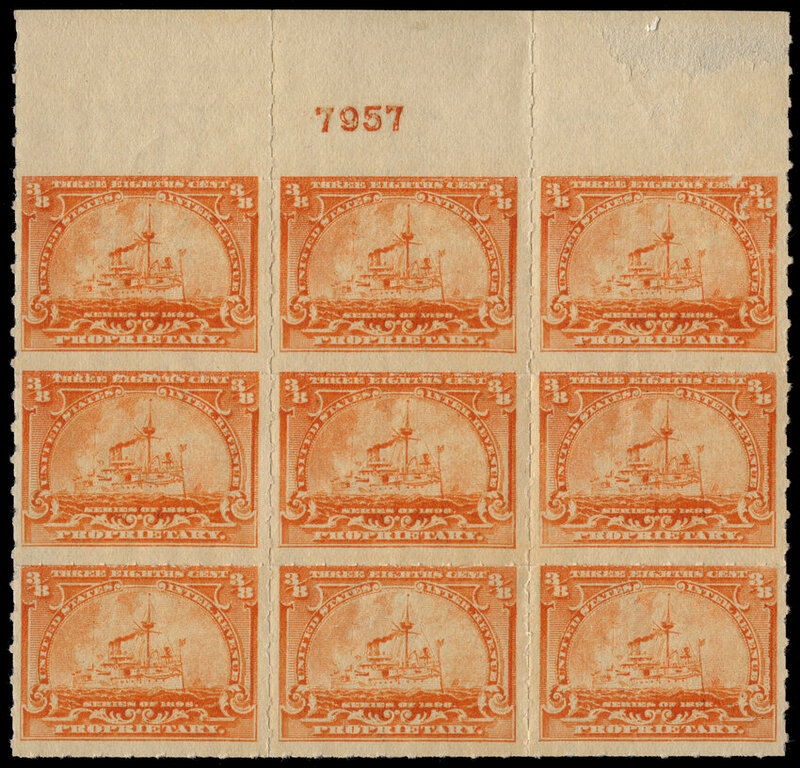 Catalog value above is from the Durland Catalog for an unused plate block of 8. 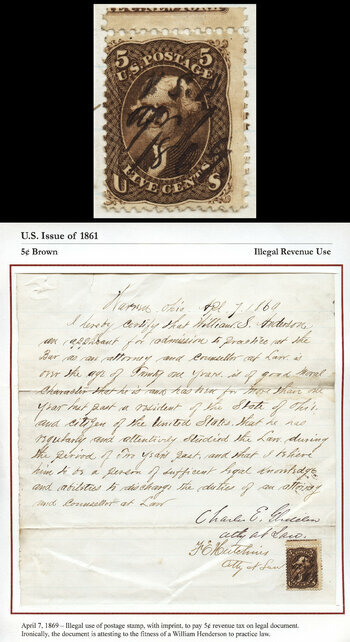 RB1a used illegally on document along with two R135 (including one with margin imprint capture) and an R24c, paying the correct 10-cent tax on a $175 promissory note. 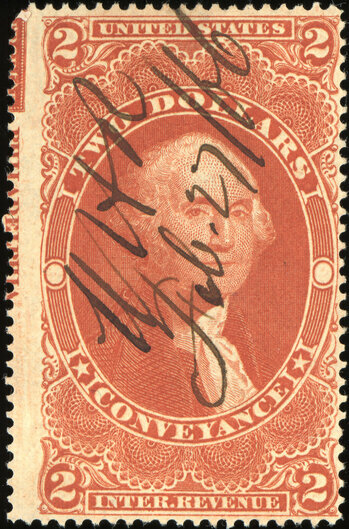 Top margin horizontal margin imprint pair. 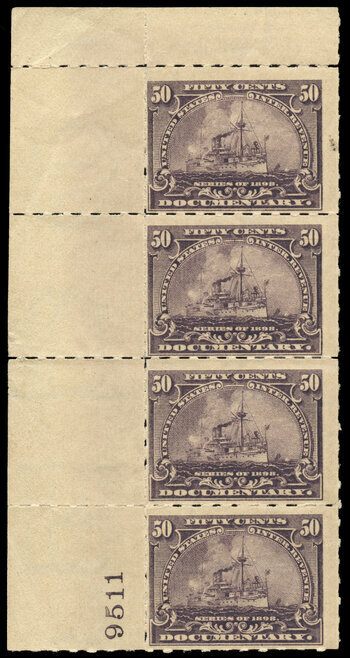 Bottom margin plate block of 4, plate 3 mirror imaged. Full gum never hinged. Ex-Cleland. 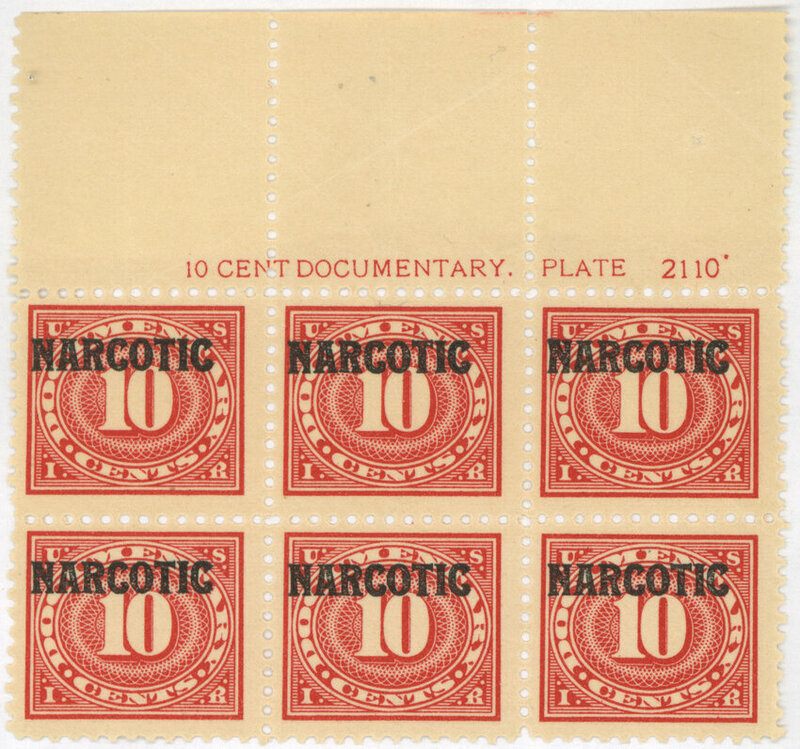 Top plate number block of 10, plate 7. Precanceled with full gum. Ex-Cleland. 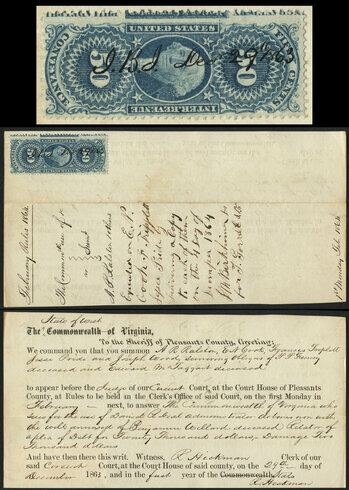 Unusual printed signature cancel, some of the lettering indeterminate. 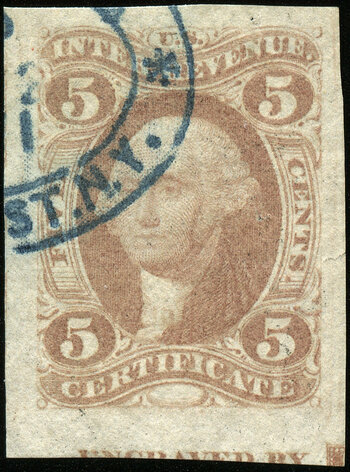 Second initial could be C, G, or E. Bottom margin imprint partially visible. 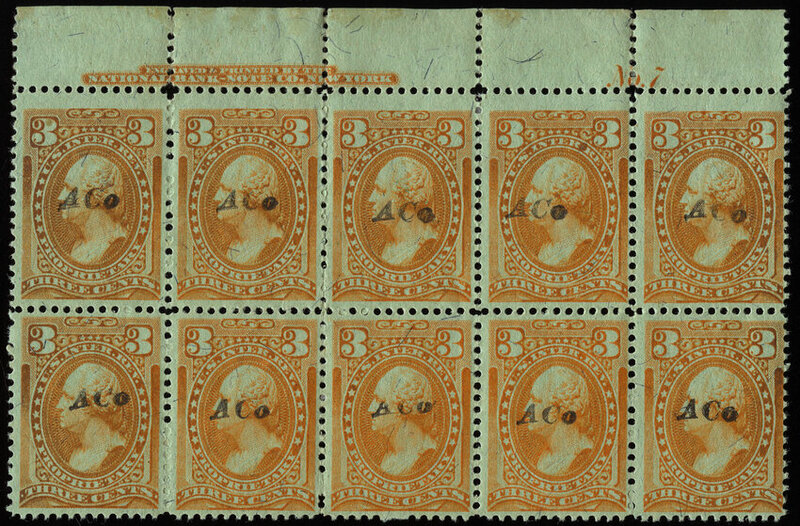 Bottom plate number strip of 3, plate 3 mirror imaged. Ex-Cleland. Pictured in the Durland Catalog. 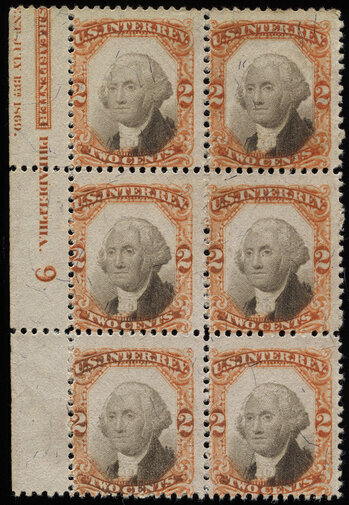 Plate block of 9, no gum. 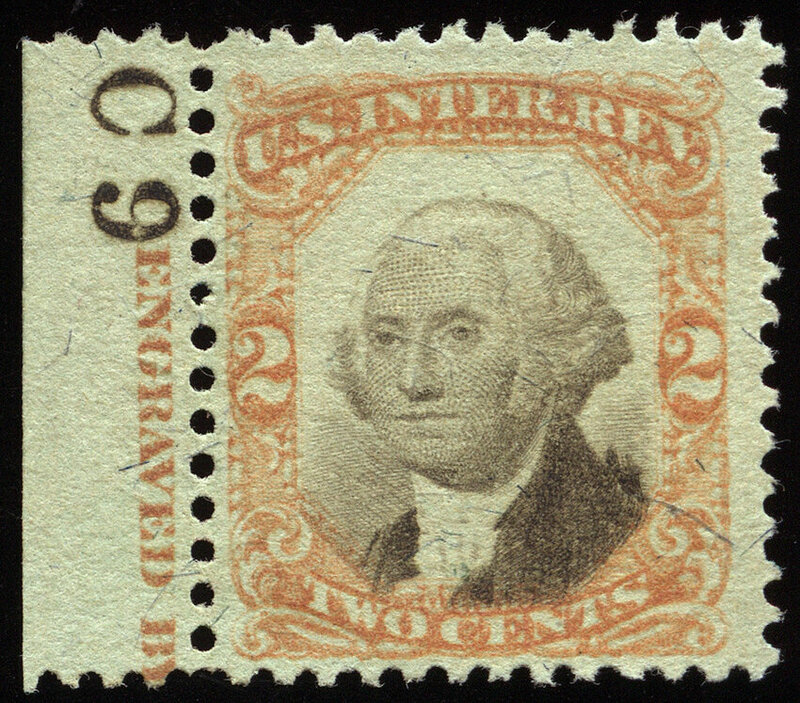 Top inscription block of nine, no gum. Plate number strip of 6. 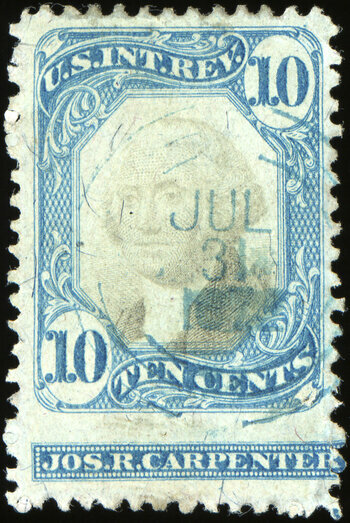 Unused block of 10 with margin imprint capture at bottom. 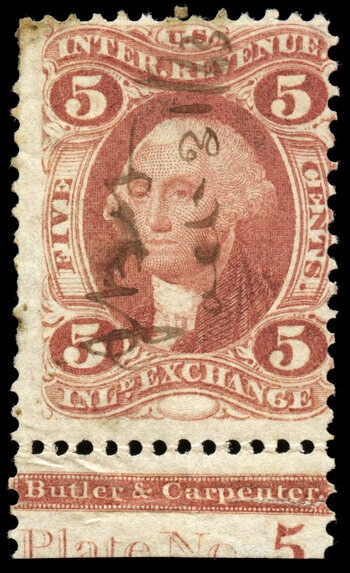 Very scarce on wine stamps. Catalog value shown is for 10 singles. Left margin imprint capture. 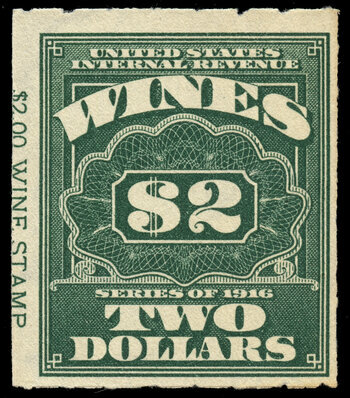 Very scarce on wine stamps. 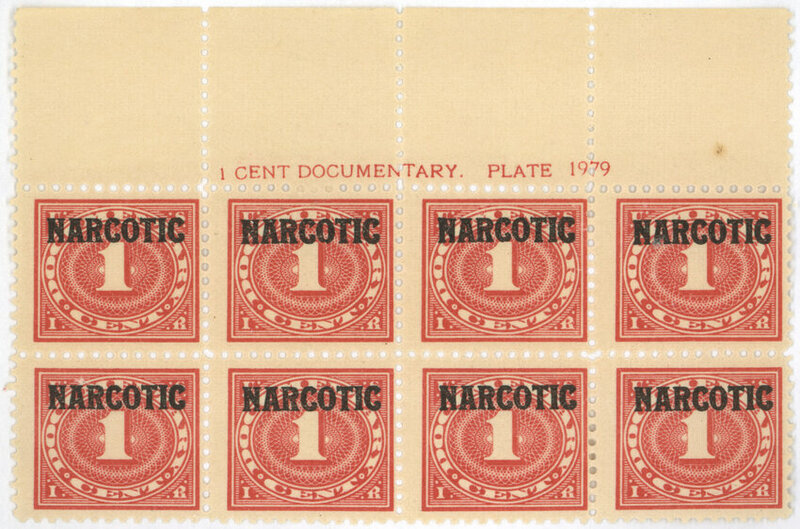 Bottom margin plate block of 4. Catalog value is from the 2016 Durland catalog. 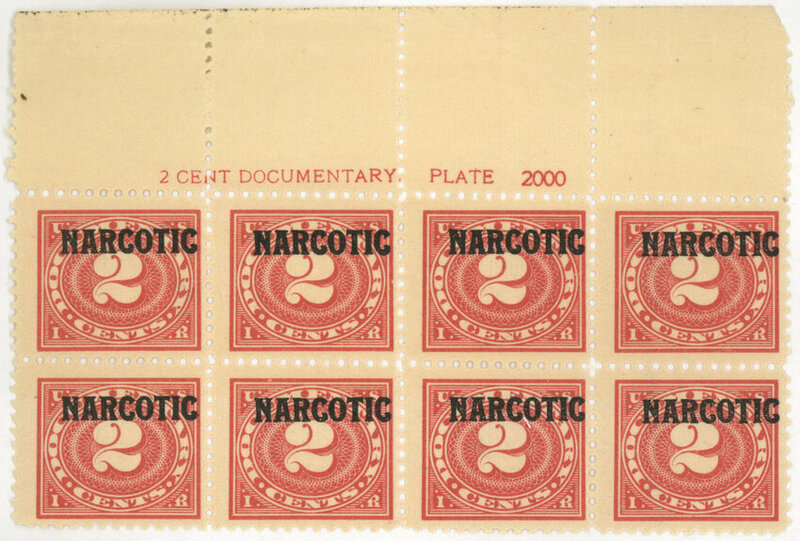 Top margin plate block of 8. 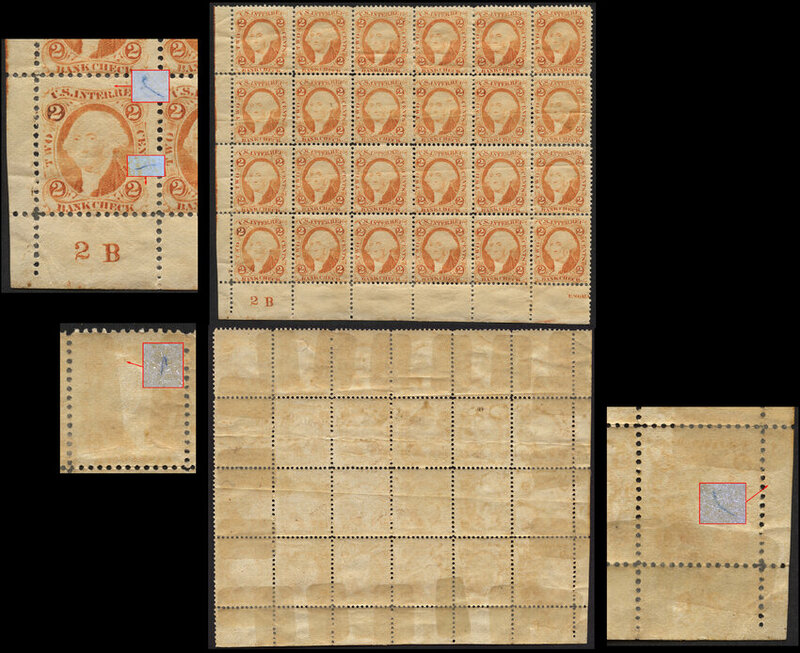 Plate block catalog value is from 2016 Durland catalog. 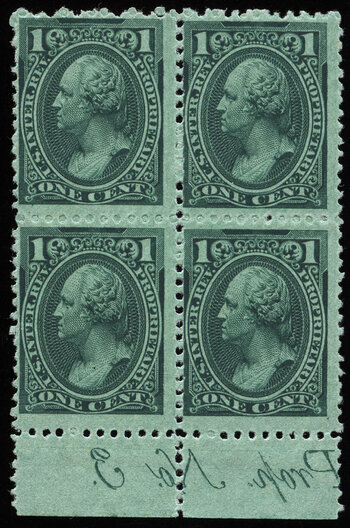 Top margin plate block of 8. Catalog value is from 2016 Durland catalog. 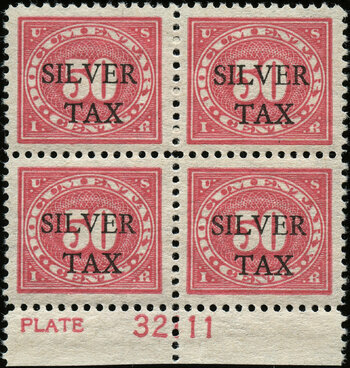 Top margin plate block of 6. Catalog value is from the 2016 Durland Catalog.